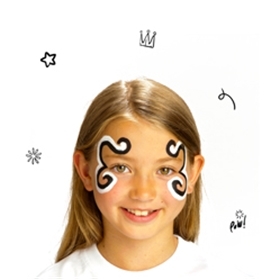 Using a BLACK face painting stick, draw on swirls coming out from the outer corner of each eye, up onto the forehead and down onto the cheek. Using a WHITE face painting stick, draw a second line following the outside edge of t black one. 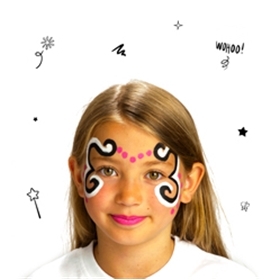 Using a PINK face painting stick, draw 5 dots in a ̋“V” shape across the forehead. Add a line of 5 dots along the outer edge of the swirls on each cheek. Paint the lips. 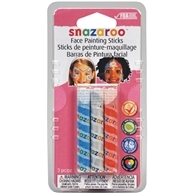 These Girls Face Painting Sticks are easy to use and very handy. You can take them to any party for instant success.